The United Nations says it fears that a humanitarian crisis may be unfolding as thousands of civilians flee the fighting between the Iraqi army and the Islamic State in the western city of Falluja. 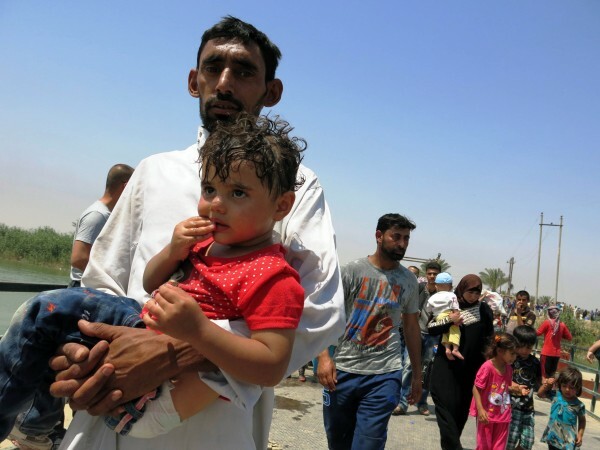 UN relief agencies say that some 80,000 civilians – mostly women and children – have fled the city and neighboring towns since the start of the Iraqi military operation to liberate Falluja began in late May. There are fears that the current number could swell to well above 100,000 in the coming days as the army backed by pro-Iranian militia and Sunni tribesmen continue to make gains in the city. The UN says the challenge is how to provide food, shelter and medical services for the displaced. The Norwegian Refugee Council, according to Reuters, cites as an example how just one latrine is available for more than 1,800 women. The UN warning comes as it releases figures today marking World Refugee Day showing that the number of displaced peoples worldwide has skyrocketed to more than 65 million. This means that roughly one in every 113 global citizens has been forced to leave home due to conflict. The UN says that more than 65 per cent of the 65 million are internally displaced, and more than 50 per cent of the total number of refugees are children. One third are considered refugees, the UN says. That means that more than 32.5 million children around the world have been displaced by war and strife. On Monday, dramatic video released by the Italian Coast Guard showed a boat carrying more than 630 migrant refugees capsizing off the Libyan coast. Italian authorities said that more than 625 people were rescued but believes at least five drowned in the incident. Italy and Greece have been the main entry points for sea-faring refugees. UN Secretary-General Ban Ki-Moon visited Greece on Saturday and urged Europe and the world community to help Athens and other countries deal with the refugee crisis. “I remained deeply distressed at the high number of deaths in the Mediterranean. We must work together to protect people and address the root causes of displacement. I continue to call for greater sharing of this responsibility across Europe and, indeed, across the world,” he said at a joint press conference with Greek Prime Minister Alexis Tsipras.